Make a flower-filled basket for a friend or a friend to be! As a real estate agent and broker, I always want my clients to settle into their new neighborhood with relative ease. Delivering a May Day basket is the perfect excuse to meet and greet your new neighbors. If you are new to the block this might be a perfect way to initiate contact with your new neighbors. If you are a 'regular' and have a new neighbor, consider making a May Basket and delivering it as a way of welcoming them to the neighborhood. The tradition of the ancient Roman and Druid holiday of May Day has endured for centuries. It has been a celebration of spring turning into the pleasures of summer. Traditionally, a 'Maypole' was the focus of the festivals. Even today the Maypole is used in the replications of old-time festivals. The Maypole is a tall pole in which ribbons are woven around by groups of dancers to make unique designs and patterns. Gathering flowers and branches became a tradition and 'bringing in the May' became a popular activity on May 1. The giving of baskets became part of the festivities later in the evolution of May Day. Today baskets are often made by little children, filled with candy or flowers and then placed on people's doorsteps or tied to the door handle, as they ring the doorbell and dash away before they are caught. You can participate in this activity yourself by making a special May Day basket or by using any basket to fill with flowers to give to a friend. Fill a small basket with freshly gathered spring blossoms. Tuck a small vase or something that will hold water into the bottom of the basket and fill the basket with a selection of flowers. Tie a bow or ribbon streamers onto the handle and fasten it to the door handle of a friend or neighbor. Possibly add a card inviting them for tea or coffee in the near future! Be creative and clever. Happy May everyone! Have a wonderful Derby week! I hope everyone had a blessed Easter weekend. While Easter comes each Spring, so does Spring weather. This past week has been extremely wet and windy. Be sure to check your home for water damage. The first indications may seem trivial but don't be fooled. A telltale sign, such as a water stain on the ceiling, can lead to real problems like collapsing drywall or a weakened roof. Learn where your home is most likely to suffer outside water damage and what you can do to help prevent it. Keep the roof free from leaves, twigs and other litter to allow for proper drainage. Make sure the air can flow freely through all soffit and roof vents. This will reduce the buildup of heat and moisture and help extend the life of the roof. Consult a professional on using a preservative or cleaner (depending on the type of roof you have) to help limit the weathering effects of moisture and remove the growth of molds and mosses. Keep trees trimmed to prevent them from rubbing against the roof or providing excess shade. Replace missing, curling, cupping, broken or cracked shingles. Watch for damage in valley areas of the roof and around the flashing at chimneys, vents and other junctions. Check your attic around flues, plumbing vents and chimneys for roof leaks, especially if you've noticed water stains on the ceilings. Clean debris from your gutters and downspouts and inspect them regularly. Think about installing gutter shields if your gutters frequently fill with debris. Place splash blocks at the end of downspouts to carry water away from the foundation or add an extra length of downspout if necessary. Every spring, have the air condition (A/C) system inspected by a qualified contractor. Make sure their service includes inspecting and cleaning the A/C condensation pan drain line. Change the filter on regular basis. Before winter starts, disconnect garden hoses from all spigots and turn off each spigot's water supply. Replace any damaged caulk around windows or doors. Repaint wood siding as needed. Fill in any low spots next to the house to help water drain away from the foundation. Even after taking the preventative measures we've discussed here, check frequently around the house for signs of leaks. It's important to find them before they cause serious damage. Simply by keeping an eye out for problems, you could save your possessions from damage, spare yourself costly repairs and even keep your insurance premiums low. And preventions such as these protect the value of your home. April showers bring May flowers--what do May flowers bring? 'Pilgrims!' This was always a favorite joke of my students when I taught first-grade many years ago. They loved to tell everyone they could get to listen to them and then, they would dissolve into a puddle of laughter, at their own cleverness. On a serious note, this is an excellent time to think about adding color to your yard. Take a good, hard look at the exterior of your home as someone else might see it and start with a pencil and paper. Clear your flowerbeds of old mulch and last fall's leaves and start sketching in how you want to enhance the exterior of your home. Starting with a plan is always best. it will minimize your time once you start your project and keep your costs in check. For very little expense and effort, colorful flowers are a good way to add value to your home whether you are planning on selling--or just want to give your home and the neighborhood a better look. You can increase the value of your home with cosmetic additions---like adding flower beds that hide parts of the yard or building that might be considered unsightly. For example, a flower bed of colorful annuals or low growing perennials along the driveway adds a feeling of elegance to the landscape. A blooming perennial can hid a water hydrant, air conditioner or other utility connection to the house or soften the sharp corners of the house or fence. Our local gardening centers are swelling with the perfect choices for our region. Did you know we live in planting zone 6? There are 11 planting zones, or 'USDA Plant Hardiness Zones,' in the United States and Southern Canada. The USDA planting zones are regions defined by a 10 Fahrenheit difference in the average annual minimum temperature. To put the definition in layman's, terms: the higher the numbers, the warmer the temperatures, for gardening in those areas. It is standard practice for seed dealers and nurseries to label their products according to their USDA Plant Hardiness Zones--that is, the planting zones in which you'll be most successful at growing those particular plants. Examples of cold-hardy plants (numbers in parentheses indicate zones): Peonies (2-9); Goldenrod (2-8); Adonis Plants (3-7); Ninebark (3-7); Oriental Poppy (3-7) and PeeGee Hydrangeas (3-8). Examples of plants that are not very cold hardy: Bougainvillea (9-11); Bird of Paradise (9-11); Gerbera Daisy (9-11); Aloe Vera Plants (9-11); Purple Fountain Grass (9-11) and Elephant Ear (8-11). Growing plants not suited to our region's climate is sometimes possible but not recommended for beginners. So--now I've told you probably much more than what you wanted to know, go forth, get dirty and improve that curb appeal of your home! 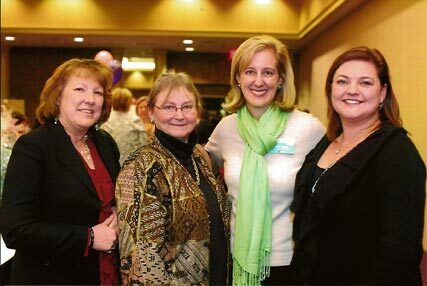 As reported on NAWBOLouisville.org , on March 9, 2011, women and business leaders from all over our community gatthered to celebrate the accomplishments of outstanding women business owners in our region. Hosted by the Louisville Chapter of NAWBO, the 17th Annual EPIC Awards Dinner & Silent Auction, honoring the Woman Business Owner of The Year and Women of Distinction, brought together together a diverse audience from the business community, representing sole proprietorships to large corporations with hundreds of employees. The event's message, 'Power Your Dream,' rings especially true when you consider that the estimated 93,233 privately held, majority women owned firms in Kentucky generate $9.3 billion in sales and employ 71,566 people. It is by celebrating the economic development successes of women owned businesses that our entire city succeeds. We here at Julie Pogue Properties are thrilled to announce that Julie was named a 2011 NAWBO Woman of Distinction. It's a huge honor, and we are proud as always of our fearless leader! More photos can be found at the Voice Tribune's coverage of the event.